There are so many awesome and fun things to do in Ho Chi Min City. It’s a huge it, even the biggest in the country. 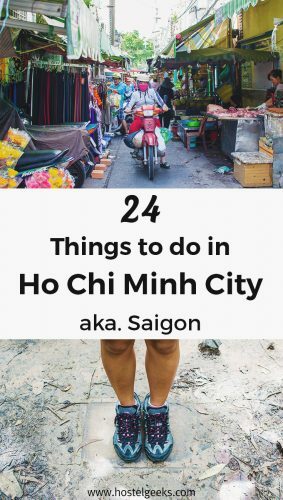 With so many things to do, we get it, Ho Chi Minh City can be overwhelming. Especially for those who may temporary suffer jet lag. With more than 8 million motorbikes and a minimum humidity tax of 60%, you might feel it difficult to go out of your hostel. Yet, it’s worth it. 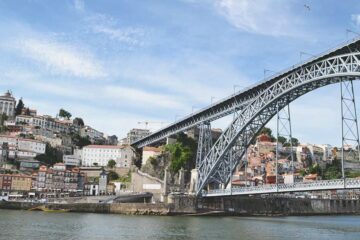 We recommend you to go and explore the city and the surroundings. When traveling to Vietnam, it is easy that Ho Chi Min City will be your departure or ending point. 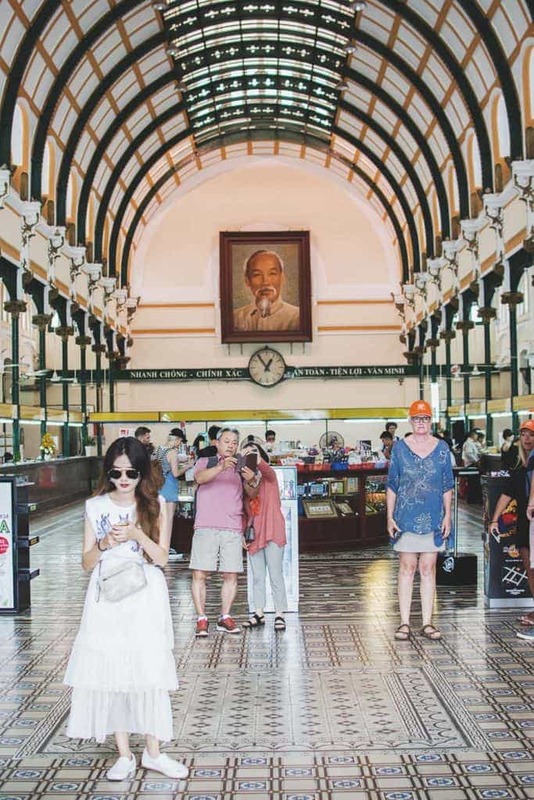 If you want some inspiration about things to do in Saigon during these days, keep scrolling. And if you are traveling around Vietnam, you hit the jackpot cause we get plenty of information for the rest of your trip too! First things first: Ho Chi Minh City vs Saigon?? Ho Chi Minh City is the same as Saigon. Ho Chi Minh is the current official name, Saigon was the official name before the American ended. However, both names are perfectly okay to use, everybody knows which city you are talking about. If you still have got doubts, go to our 5 Star Hostel in Ho Chi Min review. We have a quick explanation there about the different names. Now that we have covered this, let’s move one what to see in Saigon and Ho Chi Minh City. 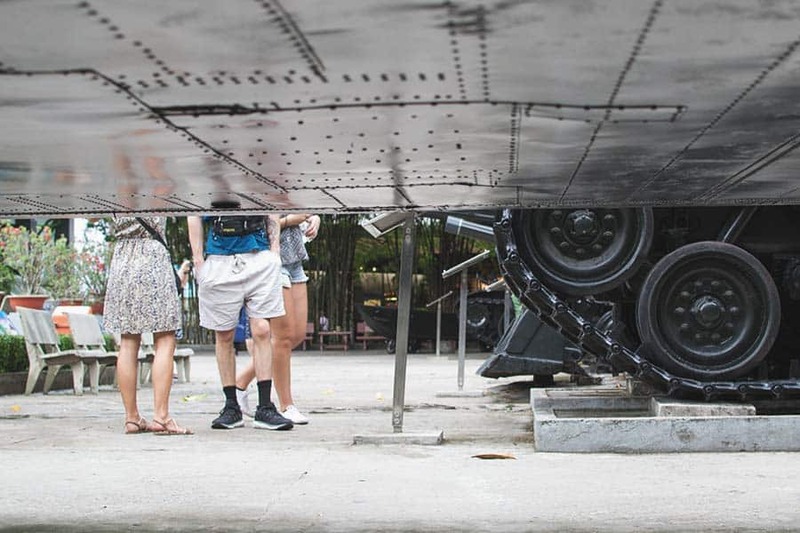 We list here things to do in Ho Chi Minh so you can get inspired. 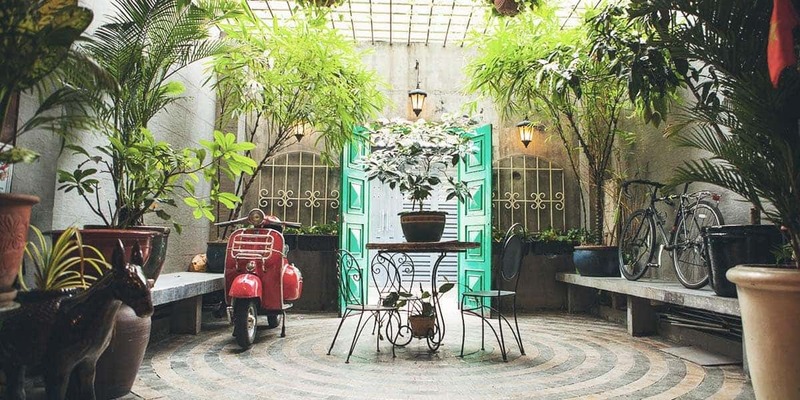 Ho Chi Minh City has many hidden places that still need to be discovered by travelers (and locals). A building that looks like a simple working place can hide the best speakeasy in the city. We have an example about that in our list. 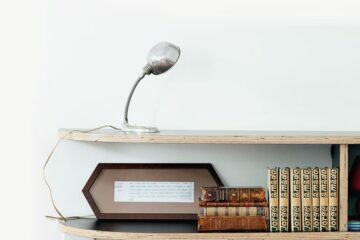 Keep reading to discover it. Ben Thanh Market is the most popular market in Saigon. 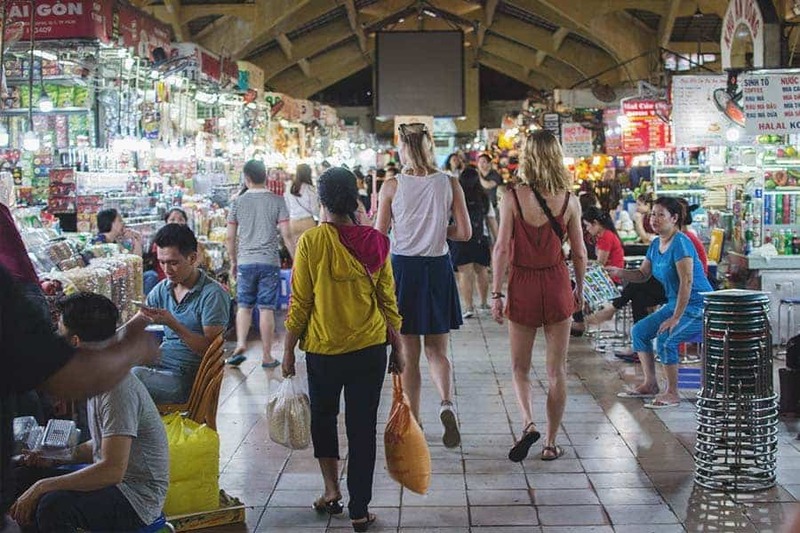 Going to a local market is one of the most popular things to do in Vietnam in general. Remember to bargain any price, even if you are happy with the price. It is part of the game! A local market that Laura, from The Common Room Project team, recommended us. Here, you can see the real Vietnam. Food, clothes, and bustle daily life, mixed with, of course, motorbikes. Pay attention, the motorbikes won’t stop and the streets are narrow. We only walked into very few tourists here that obviously got this hidden gem tip as well. A fun place! While the street with the market stalls on the left and right was quite narrow, motorbikes still passed through. This, my dear fellow traveler, is Vietnam. I recommend walking through this Cho Vuon Chuoi Market, take photos, and move on. You can also find food here. Housed in a traditional building, the Museum of traditional Vietnamese Medicine offers an in-deep look to the Vietnamese Medicine. Did you know Vietnamese Medicine is heavily influenced by Chinese philosophy? It is really interesting. 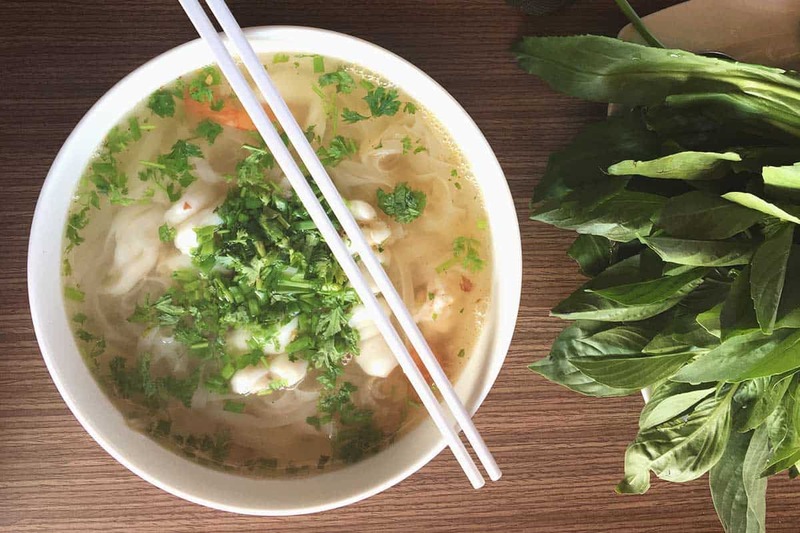 We must admit, we love Vietnamese food! If you don’t want to miss any local specialty, we recommend you to join Saigon street food. A local guide will take you to 10 tastings around the city. We are sure you will gain weight during your Vietnam trip. Enjoy your meal! With the humidity in the city, a swimming pool sounds so refreshing! Trust me, we spent more than 2 weeks here. A pool is something amazingly refreshing. 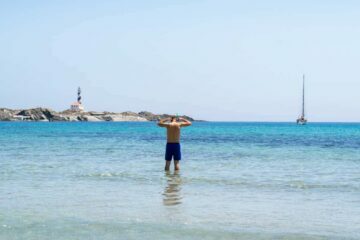 Well, some Hotels have a swimming pool, and it is not necessary to sleep and stay at the hotels to use the swimming pool. Normally, there is an entrance fee. So make sure you ask in advance what does this fee include to avoid any surprise. Just a 6-minute walk to Ben Thanh Market, Silverland Yen Hotel features an infinity swimming Pool and Sauna. Located in District 1, Intercontinental Asiana Saigon is a luxurious accommodation with leisure facilities, including a swimming pool. Good to know: expect a high fee to be able to use the swimming pool. We think, it’s worth it. Located in District 5, China town area in Ho Chi Minh City is quite interesting to see. You will find many markets, shops, temples, and pagodas. Good to know: If you are in Ho Chi Minh during the Chinese New Year, Chinatown is a must. This is where most celebrations are taking place. 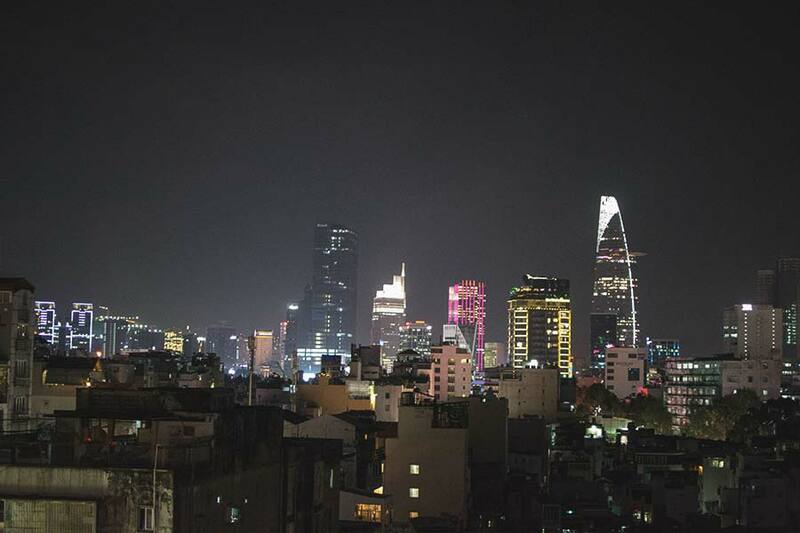 Ho Chi Minh City rooftop bar’s are a must while you are in the city. Enjoy the views from one of the Skybars the city has to offer with a drink on your hand. Chill: this was our favorite, as you can still see the traffic from the rooftop bar. 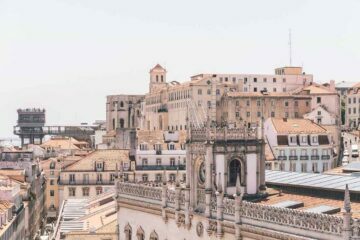 We recommend going for sunset and see how the colors in the city change. After 12, it turns to a dancing club. Glow: offering drinks in in a beach club atmosphere, this Skybar attracts well-dressed expats and locals looking to dance. EON Heli Bar: Located in the Bixteco Financial Tower, it is the highest Skybar in Ho Chi Minh city. The View Rooftop bar: located in the backpacker’s street, Bui Vien Street. This rooftop bar is located in the 9th floor of Duc Vuong Hotel. It is known for being one of the cheapest skybar in the city. Watch the locals at the Ho Chi Minh State Garden, one of the main streets where many venues are held. We had a coffee and Sushi at Sushi 79 in a building overlooking the promenade. This street, the Nguyễn Huệ is a wide, broad and long street. Street artists perform here, small musicians play their music. It’s really street full of the joys of life. There is also a cinema nearby, showing movies in Original Versions. Along this boulevard, there are some colour fountains, as well as many shops, restaurants and cafés. If there is an event in the city, it’s likely that it will happen here. We recommend going to 42, Nguyen Hue Boulevard, pick a restaurant or café in the upper floors with street view, and sit with a drink. Take your time to admire the fountains, the people walking around, and the vendors who play hide and seek with the policemen. Yes movie lovers, it is possible to watch a movie in English in the city! And the cinema has air conditioning, a plus to consider in this warm city. Actually, bring warm clothes because it is going to be cold inside. Pay attention if the cinema shows the movies in Original Language. You can find the cinema schedule here. The Saigon Opera House is located in a French Colonial building in the heart of Saigon. Many people say, this is the place where East meets West. 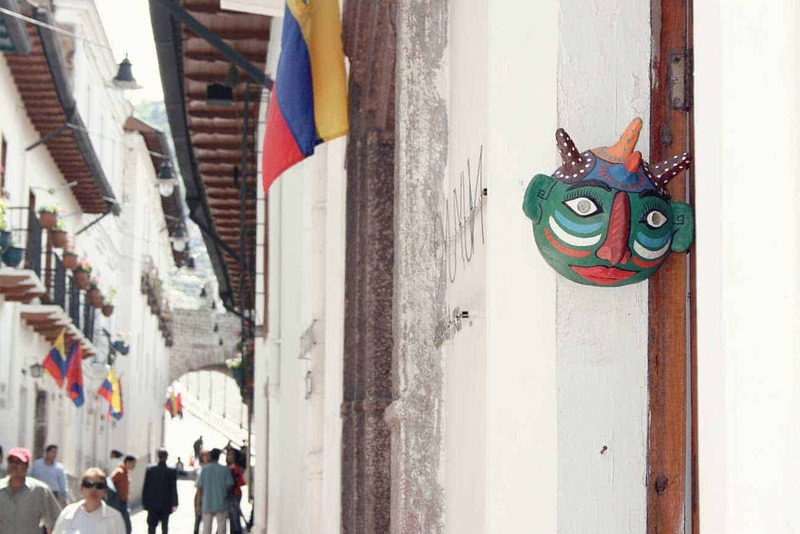 You can simply visit it or buy a ticket for one of the cultural shows. Notre Dame Cathedral is one of the few remaining strongholds of Catholicism in Vietnam. Vietnam being a largely Buddhist country, this Cathedral is interesting for many foreigners. It can only be seen from the outside. 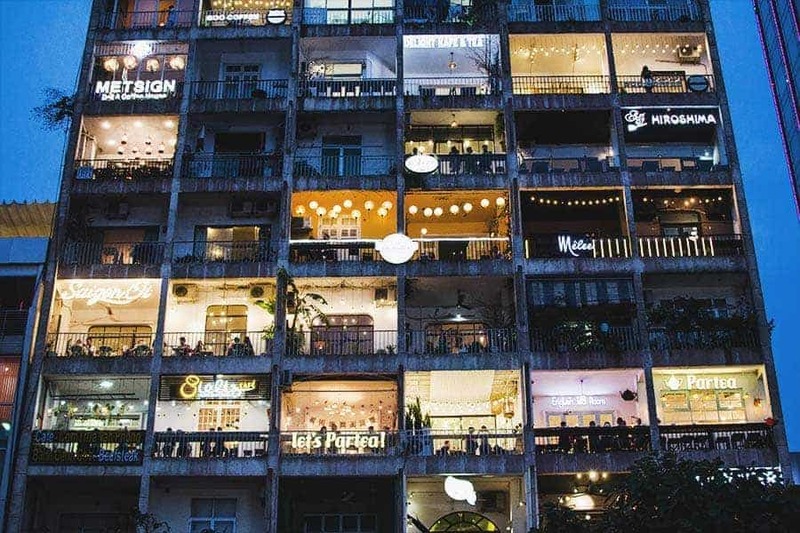 Located in the heart of the city, this building is one of the absolute Ho Chi Min City points of interest. You can see why, right?! It is really photogenic, one of the most beautiful post offices we have ever seen. 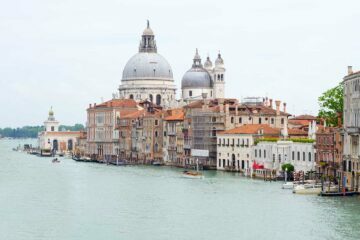 You find a mixture of Gothic, Renaissance and French influences. It is also one of the oldest buildings in the city. This post office, yes, it’s still one, is directly across the street from the Notre Dam Basilica. You can tick both sights in Saigon off at once. If you are a Coffee lover, Vietnam will be your paradise. Even if you are not, you will love Vietnamese coffee! Matt loves coffee, so during our travels we do always find design Cafés with tasty coffee. To find these nice Cafés can be tricky, as many places are hidden in buildings which do look like as an office, or even abandoned. We are sure the city has many, many more. Feel free to add your favorite on the comments below. Near the history museum, the Botanical Gardens are the place to stroll with giant tropical trees. There is also the Saigon Zoo, but it is not in good conditions. 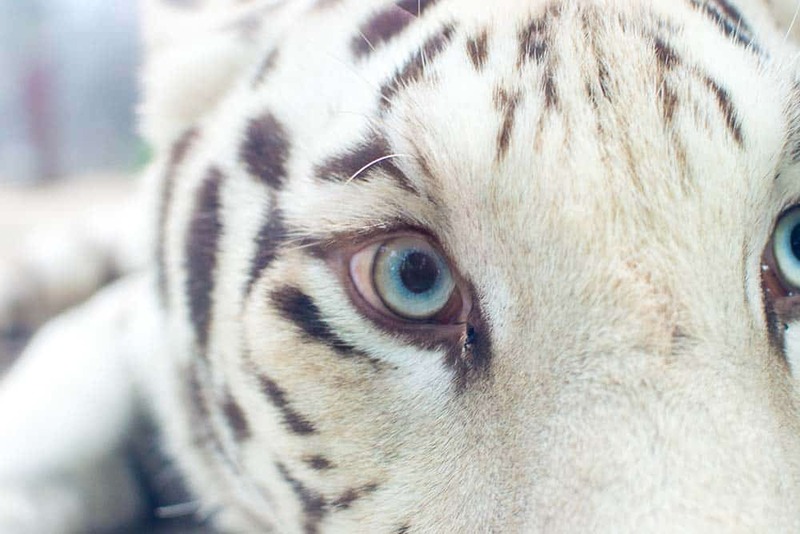 There you can find elephants, white tigers, hippopotamus, monkeys, even a lion. We do not recommend to visit the Zoo though. The animals seem not be taken care of really well. 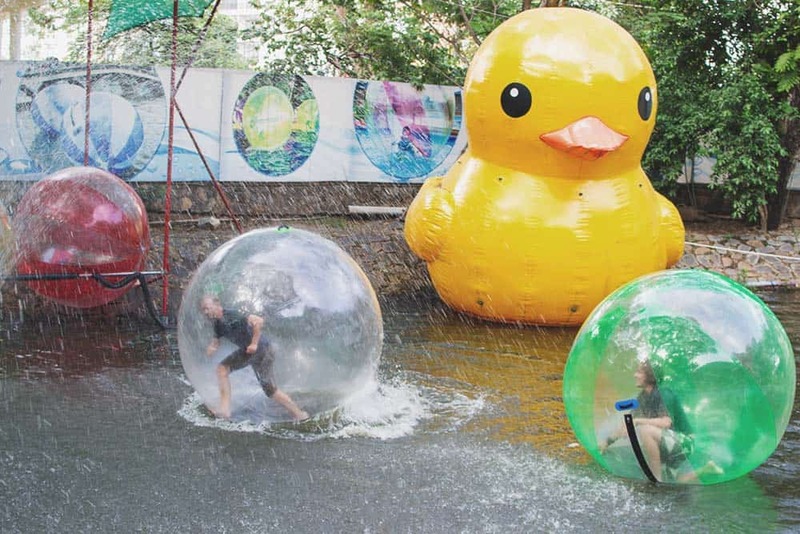 This is actually also one of the cool things to do in Ho Chi Minh for families. In the botanical garden you find a couple of games for kids….or, well, for us! The most visited museum in town and one of the most famous war museums worldwide. 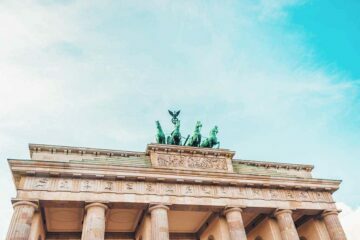 If you only want to visit one Museum, make it the War Remnants Museum! The war remnants museum contains exhibitions from the war period. Original helicopters and tanks, and a lot of stories behind. Bear in mind, the War Museum do close from 12 to 13:30. Make sure you check always the official schedule. If you happen to be in the area, there are restaurants and cafés to make your waiting time much more enjoyable. Great Tip: ask for the prices before ordering your coffee and food. Built in the 20th Century by a community of Cantonese, Jade Emperor Pagoda is one of the 5 most important pagodas in Ho Chi Minh City. In Ho Chi Minh City, you will find many live music events. Whatever your music taste is, you will find it, we are sure of that. Our recommendation? Go to Inidka, known as the House of curiosity. It is a place to chill, work, create, eat, and drink. The vibes are simply amazing. You can check their events in Indika Facebook site. Just a s many other big cities, for instance Bangkok, many things happen around the Backpacker street. 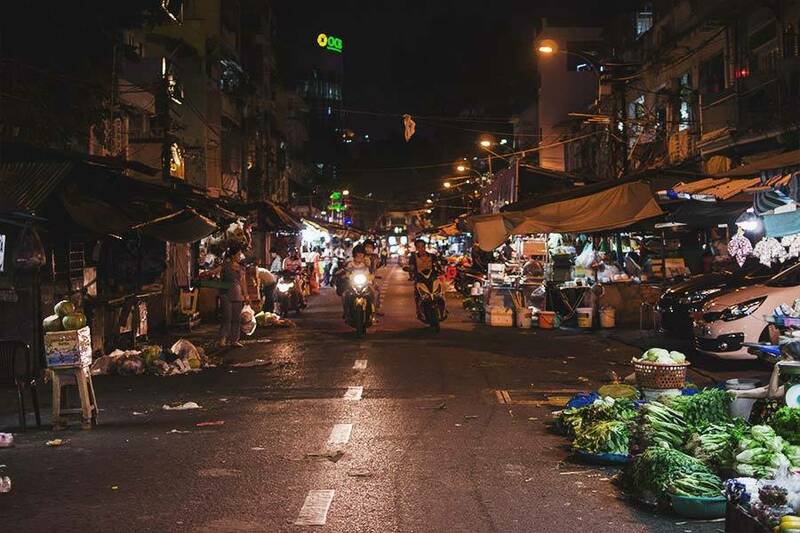 In Ho Chi Minh City, the backpacker street is Bui Vien Street, it is very central. If you are curious, go and see. Personally, we found it totally overrated and busy, very busy. We found many other streets around Saigon more interesting, like Cầu Ông Lãnh, where the food market takes place. 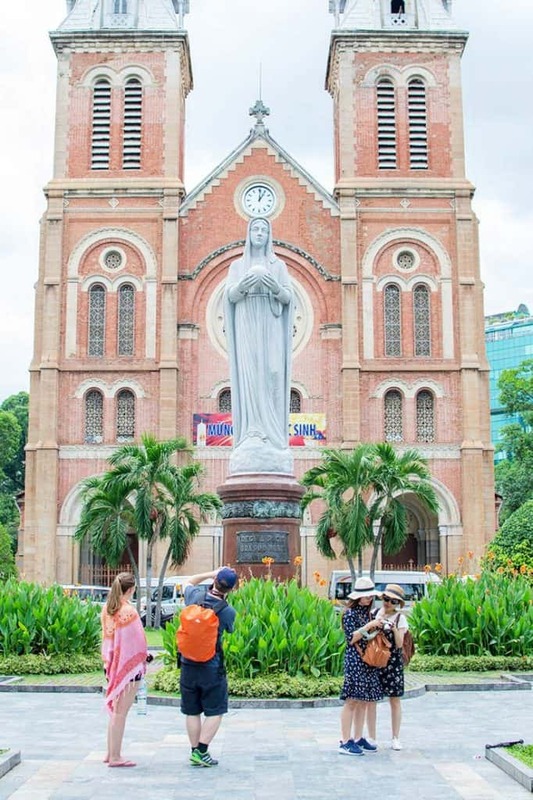 The pink Cathedral is known as Lady Pink for many people, Tan Dinh Church is a church built during the french colonial period. It is the second largest church in Ho Chi Minh City, after Saigon Notre Dame Basilica. For those looking for party, HCMC won’t let you down. There are many bars and discos around the city. Go to a skybar like Chill or party like a Local, meaning… KARAOKE! We found a tour which combines food and karaoke with locals. Our best recommendation would be: Stay at The Common Room Project and join the fun times with the team and fellow hostel mates. The hostel runs several events. For instance, if the crowd feels like, the hostel crowd moves to a disco to party all night long. 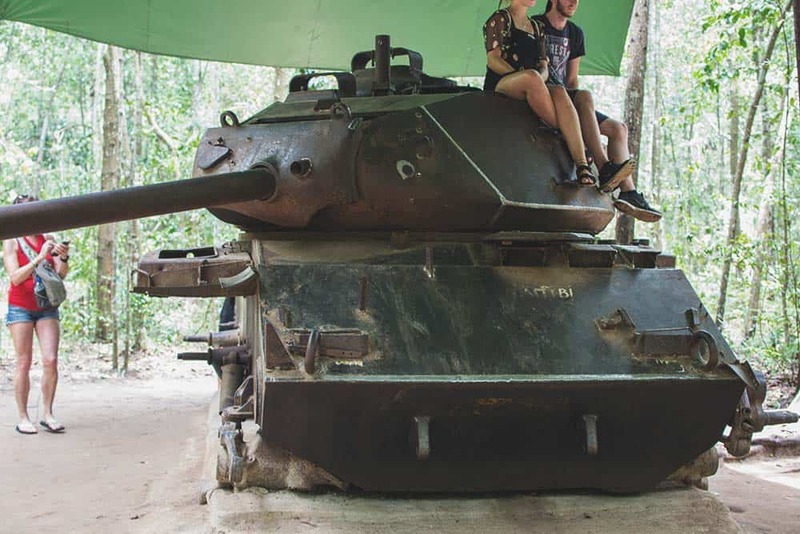 Visiting the Cu Chi Tunnels is a must thing to do in Ho Chi Minh City. 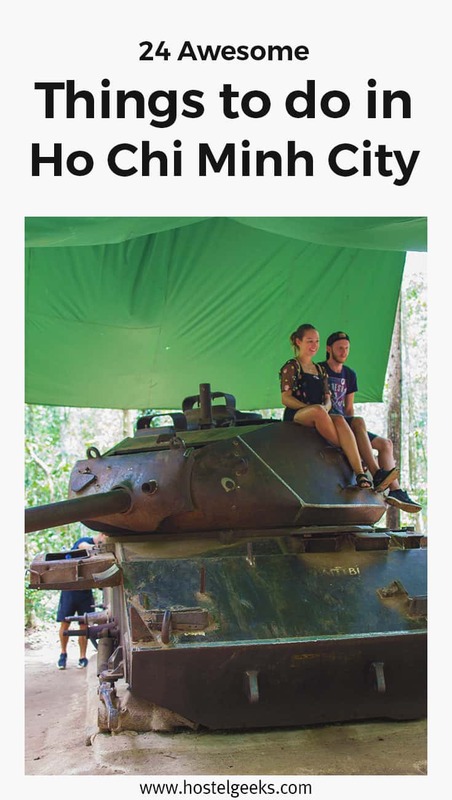 Together with the War Remnant Museum, these two things have to be off your list before you leave. Having a guide, will help you get many details and facts about the tunnels. You can contact The Common Room Project or book in advance a Cu Chi Tunnels tour here. The Cu Chin Tunnels are located around 1 to 1.5 hours outside the City. I recommend getting an organized tour. 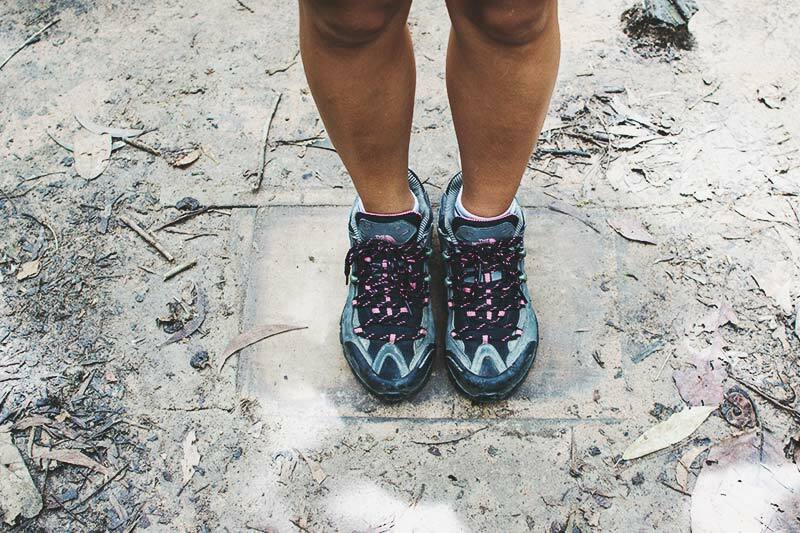 The guide will take you around the area where the Cu Chi Tunnels can be visited. You can actually enter in one of the tiny holes in the ground. The guide will show you the traps. One highlight for – mostly male – guests is the opportunity to shoot an actual Kalashnikov weapon. There is an area you can fire those guns. They make a hell of noise. While you are walking around the area with your group and guide, you can always hear people firing these guns in the background. To be completely honest: It added some authentic flavor to the whole sightseeing. The whole visit was terrifying, eye-opening and super curious! Last but not least, before leaving, you have the chance to try the food the soldiers ate sometimes for years. You can also purchase at the end of the tour some alcohol with scorpions in it. I do not support this practice, but up to you. We could not finish this list of things to do without a Motorbike ride. Traffic is crazy, and it can be fun to experience! Yet can it also be scary. With more than 8 million bikes, the fastest way to move around the city is with Motorbike-taxis, called Xe-Om. We would recommend you to take a deep breath and give it a try. Think about it: how often are you able to do ride along HCMC? And these guys certainly have the experience to ride in such a crazy city. But how to get a taxi without getting ripped off? Here our trick, which is also valid for ordering car taxis. Get the app called Grab on your smart phone and ask for a Motorbike Grab to get a ride. With Grab, you won’t have to discuss starting and finishing point, as you will mark it on the map. Neither the price, they indicate an approximate price, so you will know beforehand how much your ride will cost. You can avoid district 1 if you feel overwhelmed by the city traffic. But we encourage you, a motor ride is a real experience! We mentioned above some things to do at night in Ho Chi Min. But you might be wondering: Is there any party area in Ho Chi Min City? 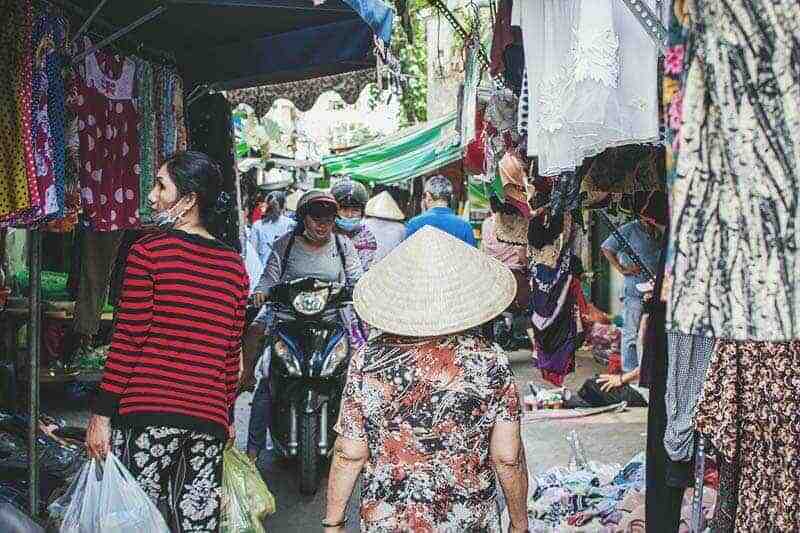 Many people go to the Backpacker’s street, Bui Vien Street. There, you will find many bars with music and food. In my opinion, this street is not fun at all, but only full with drank tourists and annoying PR’s. If you wanna have fun, go to a Skybar. At Chill Skybar you can have the first drink and extend the night, as it turns to a Dance Club. Note: if you want to sleep, do not stay at the backpacker’s street. It is very loud. 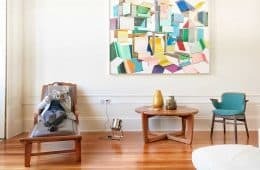 Where to stay in Ho Chi Min? 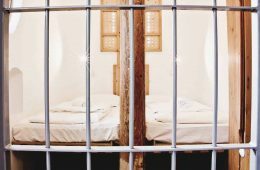 While we were in Saigon, we tried different accommodations. We did not stop until we found the only 5 Star Hostel in Ho Chi Min. Our 5 Star Hostel The Common Room Project is a real oasis in a bustling city. Cool vibes, great design, and helpful staff that will help you enjoy HCMC at the fullest. TCRP is a memorable starting and finishing pint for your trip around Vietnam. 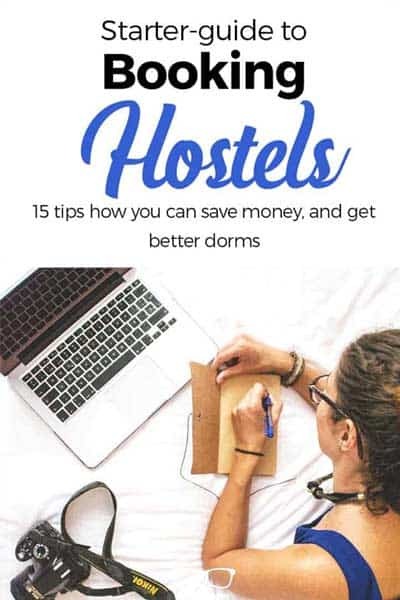 Not a hostel person? No worries at all, you find many types of accommodation in Ho Chi Min City. I do recommend you to read the reviews before booking any hotel. 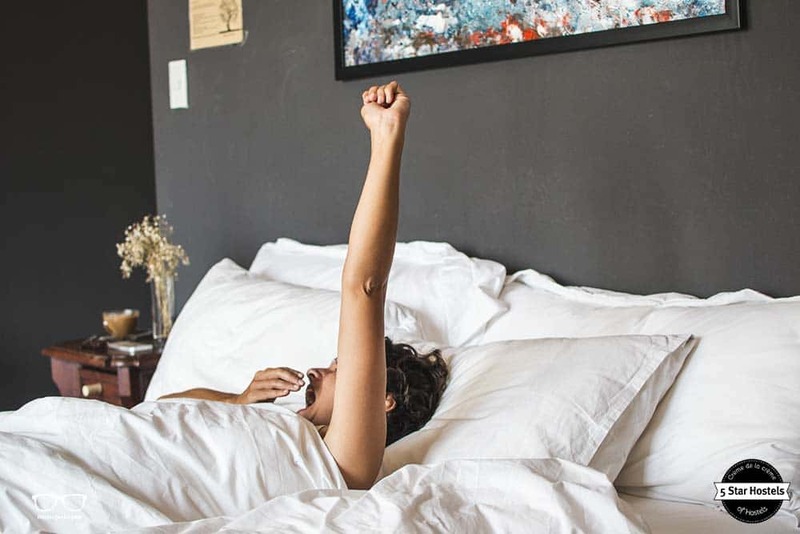 The quality does not depend only on the hotel category, so make sure you have an idea about what kind of hotel you are booking. 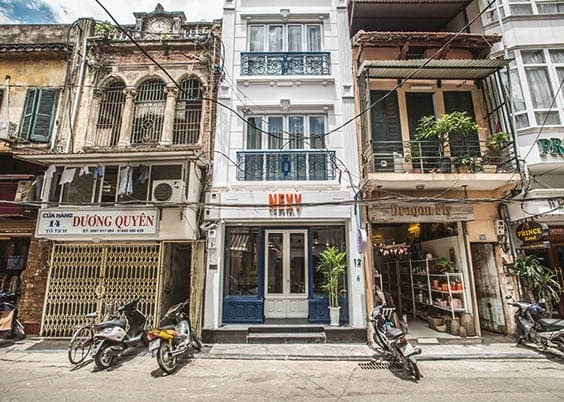 Another great option for Ho Chi Min City is staying with locals. That way, you can get to know the culture better, and they can provide you some information. 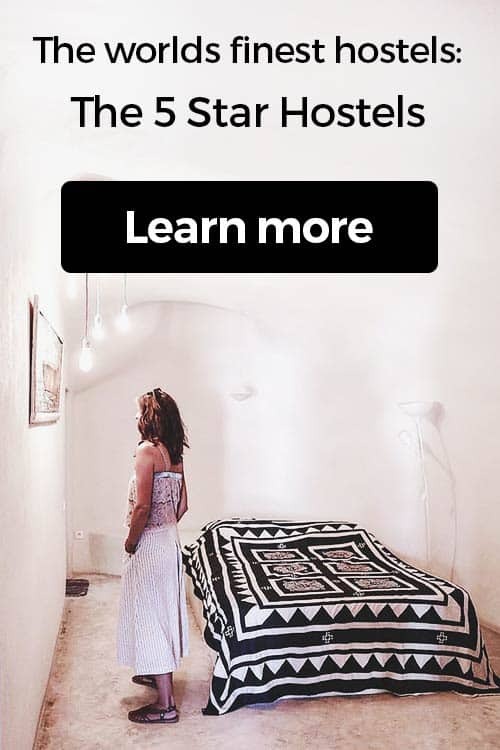 You will find many homestays at Airbnb. 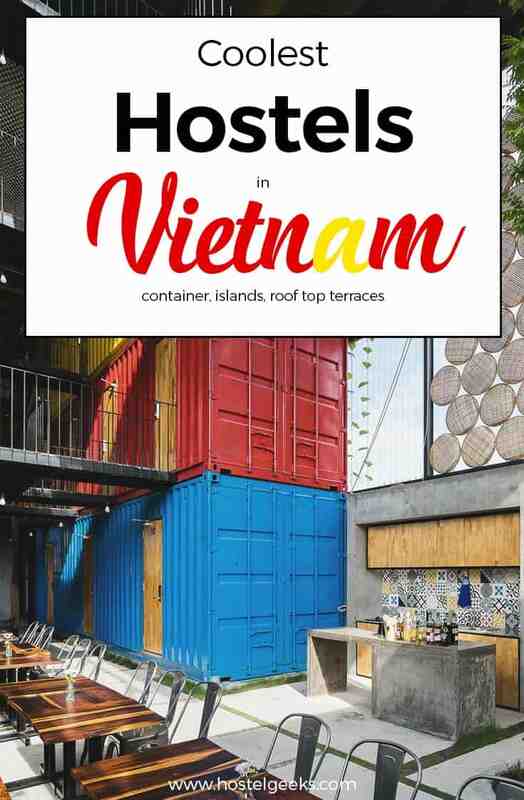 Talking about budget accommodation in Vietnam, there is a wide range of super cool hostels. When we traveled around the country, we stayed at shipping container hostels, hostels with roof top terraces, beach hostels, and so on! 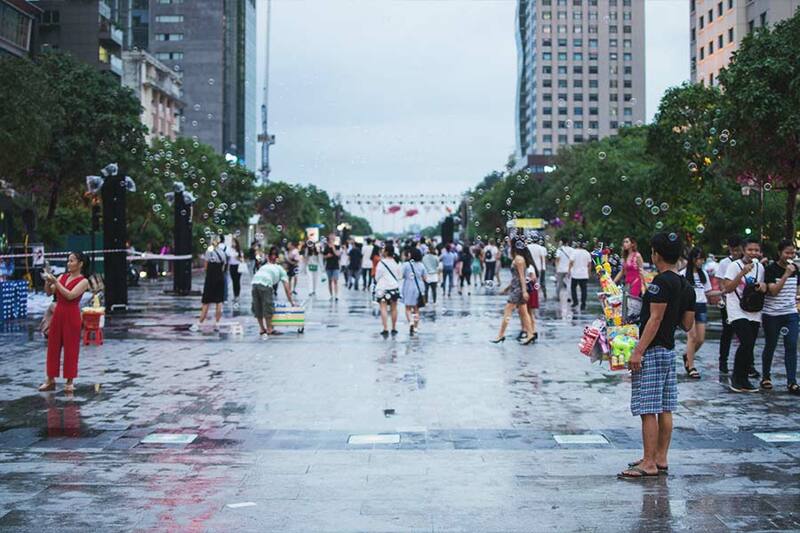 As you could see, Ho Chi Min City offers many different things to do. Many people do skip Saigon, or they just stay one night. 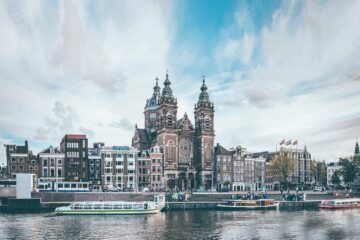 I must say, if you only stay one night it is very probable that you won’t like Ho Chi Min City, as to know the city you need more time. I would recommend to stay at least 2 days in Ho Chi Min City if you want to enjoy it. Also good to know: be prepared for the weather, it is going to be hot and maybe rainy. Make sure you check the seasons weather for your travel, it can change a lot in this area! 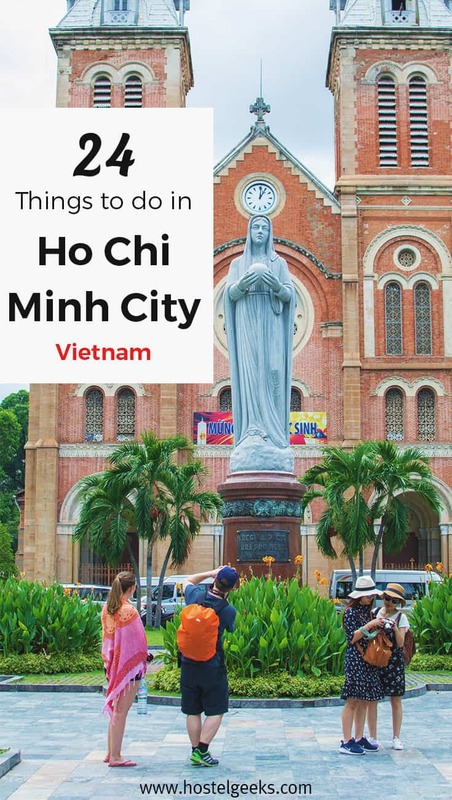 There are many printed guides about Ho Chi Minh City, Hanoi and Vietnam in general. I recommend the following three. 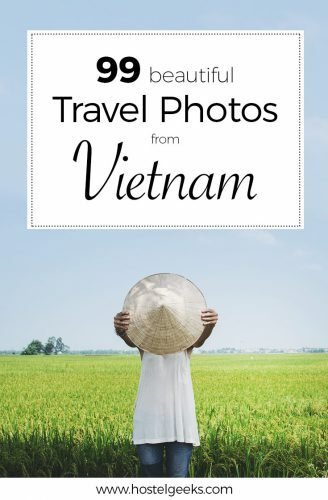 If I were you: I pick the Lonely Planet for whole Vietnam. It covers more of the country obviously and shares as well some background information on the bigger picture. Then please please bother me and leave me a comment. 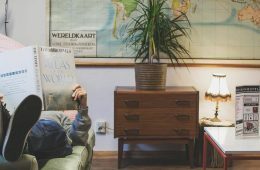 I would love to have this article as informative and useful as possible. 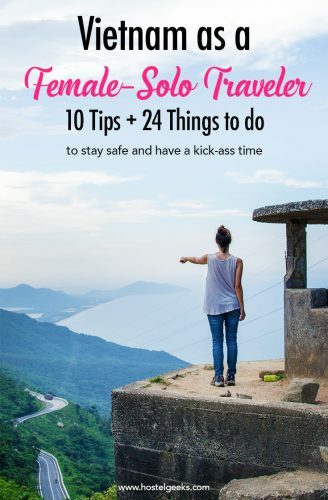 Your question actually helps me, yourself and all our fellow travelers. This way I understand what I have missed, not covered or described poorly.